For some people, too much of a good thing can be a bad thing. The good thing is credit, which leads to the bad thing: debt. The average credit card debt per household is $15,799 — that’s with the average total household debt being $54,000. Unfortunately, there’s more bad news. The average debt of a household will increase 1.48 percent over the holidays. Thanks to clever marketing and intense promotion surrounding discounts and savings, it’s easier for the holiday consumer to rack up large amounts of debt. According to a CNN Money article, in 2012 consumers spent over 59.1 billion dollars during Black Friday. This increase in purchases is about $300 per person and it can easily multiply with interest for those who use credit. However, the impact of debt lasts much longer than your new holiday gadget. With the introduction of mobile and smart phones, consumers have been able to find a deal without ever having to leave their home. CNN Money revealed that 24 percent of the purchases made in 2012 were from a mobile device. A growing number of retailers can count on making 40 percent of their annual sales over the holiday season. Statistic Brain, a statistics research company, revealed that 14.7 percent of American families exceed 40 percent of their income. Additionally, the average household debt dropped in 2009. While that drop might sound good on the surface, this statistical change was actually a negative sign of debt burden. Much of the decline in household debt caused consumer debt to be written off instead of paid off. Due to the write offs, credit companies became more restrictive with their lending. This in turn forced people to change the way they spend their money.. The good news is that for the last two years, credit companies have been less restrictive with their lending, allowing more people to obtain credit. 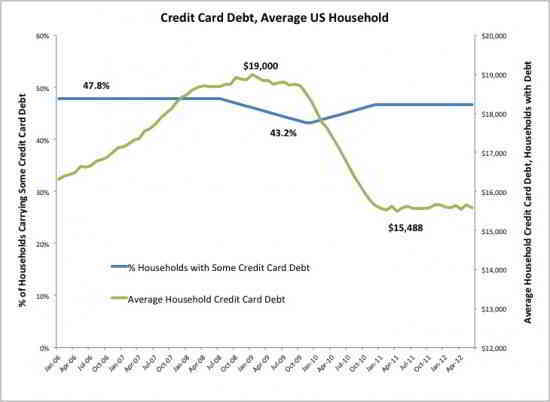 As a result, credit card debt has begun to inch its way back up. While the job market slowly catches up with the economy, many people are relying on credit to make up for a decrease in income and to meet their daily needs. Although the credit card debt statistics show there has been a steady increase in credit card purchases, people are still cautious with how they go about making those purchases. Credit card debt has maintained an average of $15,000, below 2009’s high of $19,000 for an average U.S. household. Although the future of credit stability is uncertain, the best way to avoid the long term impact of debt is by knowing your spending limits and using cash as often as possible. Although those holiday deals look great, think twice before applying for any retail sales cards, racking up charges during Black Friday, and use common sense. Don’t spend more than you already have and plan ahead. Set your shopping budget, make a list, and stick to it. Previous Previous post: Is Black Friday The Best Time To Buy?